Carter Products USA have, as far as products are concerned, been in development mode recently. The latest offering is the Carter MultiRest - a centre steady. Centre steadies are an often overlooked piece of kit for woodturners and that is a great shame. They can be invaluable for certain applications such as long spindle turning, large hollow forms and believe it or not, some bowl work. That said, there are limitations with some designs, namely having to fit the rest in place before starting work, or having to remove the work before fitting the rest in place. With some, you also cannot get the wheels to be in precisely the right spot on the work and some items are just downright fiddly to adjust quickly. Well, Carter Products have taken a long, hard look at these and some other issues and come up with a radical new design of centre steady. The steady is basically a large ring constructed of laser-cut thick steel sheeting pieces spaced with anodised aluminium blocks. The ring is designed to be in sections and has three areas in which the arms - of which there are four in total for you to use, made from extruded aluminium - on which the rollers fit and can be moved to different positions as necessary. 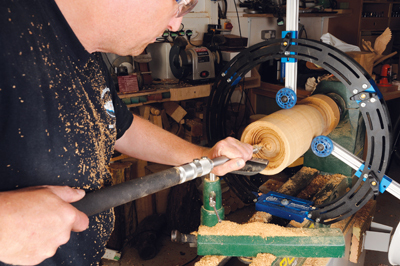 The ring also has a join in it which allows you to lift or flip/roll it out of the way or completely remove the top section of the steady so you can, if you need to, fit the steady on the lathe while the work is still in position between centres. It can also be placed on a chuck or you can have it in place and assemble it later on. The flip-over joint is held in place via a butterfly knob machine screw. 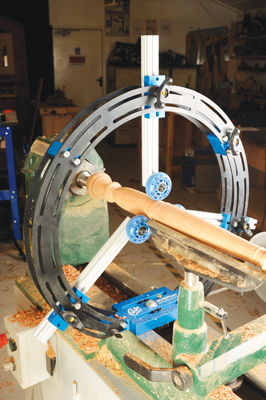 The MultiRest is fitted onto the lathe bed via an anodised block which fits between a double-bed-bar/track lathe bed. The bolt is slotted through a block and is attached to a rectangular thick plate which sits underneath the bed bars and is toggled/moved to straddle across them. The bolt is tightened to hold everything firmly in place. There are two lengths of bolt supplied to cater for varying bed depths. I have to say that whilst there is an instruction pamphlet, the whole assembly process took me about 15 minutes and I was up and running. I tried the MultiRest on all forms of work and loved the fact that you could bring it into play when needed, although some thought may need to be given when working large pieces as it is better to have it ready placed and ready for adjustment later on. I used a combination of two, three and four wheel supports on work and found them easy to adjust; a small spanner adjustment is all that is necessary. of a bowl and on hollow forms. It was so much easier and resulted in a massive reduction in vibration while working on the pieces. You can work longer overhangs than before using these. The MultiRest is very stable and I didn't notice any rigidity issues at all whilst in use. I found this centre steady great to use. Depending on the work you undertake, centre steadies can make a drastic difference to you. This is one of the slickest, stylish and best I have come across. I love the flip-over function and wonder why this type of product hasn't been more readily available to us turners up until now. It isn't cheap and therefore isn't an impulse buy, but if you need one this should definitely be on your list. Maximum diameter piece that can be turned: depends on the swing size but the largest would be 355mm on a 460mm swing lathe. 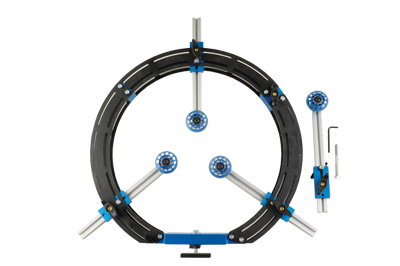 The MultiRest fits lathe bed way widths from 25mm to 90mm using the standard locking plate, but can accommodate way widths up to 115mm with optional locking plate. On the lower end you can accommodate a full-size piece minus about 25mm for the baseplate. Your only limit for lathes 355mm and smaller is the swing size of the lathe. Thus a mini 255mm lathe can accommodate a 230mm diameter; a midi 305mm lathe can turn 280mm diameter and so on up to 355mm, which could accommodate a 355mm turning. As the overall ring diameter is 510mm and the inside diameter is 460mm, the theoretical maximum is around 355mm due to wheel clearance next to the ring. Thus any lathe from 355mm up to 460mm would be limited to the 355mm maximum diameter. 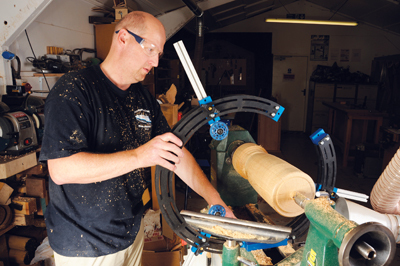 Where you start to lose diameter again is in the upper end when the swing is over 460mm as the centre starts moving closer to the upper ring section, thus on a 510mm swing lathe you may only be able to turn a 330mm piece, a 230mm piece on a 610mm lathe, etc. Further specifications can be found on the website.